"The logic here is that with the national and the global economy expanding and growing, what would be the best global standards to calculate GDP? 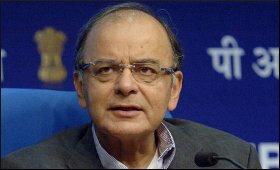 So, in every 10-12 years, it is revised and is brought about in accordance to the best global standards so that the ground reality of the economy gets reflected in the GDP figures," Jaitley told CNN-News18 in an interview. "There were personal tensions between the two officials. Both of them have their own positions. The Supreme Court is ceasing it. What has the government done? ... The government did not provoke a fight between the two of them. They contested the case and the matter is in the Supreme Court. Whatever the court decides will be final," he said. On Congress president Rahul Gandhi's charges that CBI Director Alok Verma was forced to go on leave because he was planning to investigate the Rafale deal, Jaitley said "When there is nothing, this is just Rahul Gandhi's imagination. An imagination from which only lies crop up. You don't investigate without a shred of paper with you." On the issue of pressure from RSS, VHP to build Ram Mandir, he said "Because it is in the court, I don't want to say much." "If there is anyone who has an issue with it, let us have a referendum on whether people are with Ram Mandir or not and the reality will come out in the front. So, only because there are sentiments attached, people get excited. I cannot find faults in them. Therefore, if we want Ram Mandir, in the right sense, that is we want it, naturally, then the most appropriate way ahead will be keeping the constitutional and legal provisions in mind and with patience." "I really want all of them to come. You commit offences here, loot the country and then flee to the world's role model democracy, England, and sit there... We would want all of them to come back and they're held accountable in front of the law of the land," he said. "I think 2019 is going to be a great election, as far as India is concerned. I am confident because India does not want an unstable regime which will upset the India regime. It does not want an unstable alliance which will collapse within days. It probably will collapse even before the elections," he said.